Half the fun of having a career in aviation insurance is talking to pilots and hangar flying on a daily basis. At Aviation Insurance Resources (AIR) we do not make ourselves only available when it is time to renew or sell a policy, we love making new pilot friends and sharing stories about an industry we are so passionate about. 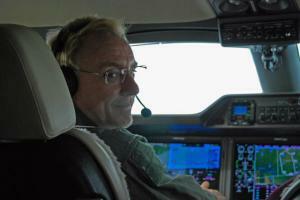 We recently sat down with one of those friends, aerospace engineer Peter Rouse. Both of my parents worked for Beech Aircraft. My dad worked for them for 25 years, and I have his gold watch that Beech aircraft gave to him. My mother is on a Beech Aircraft employee’s handbook from the late 1960s; she has her lunch box in her hand, and she is wearing a sleeveless blouse and cat’s-eye glasses. I started my official flight training in college in the late 80’s, but I ran out of money. I finally was able to get my Private Pilot certificate in December of 1993. Over the years, I kept flying. I got my CFI in 2000, my CFII in 2001, my MEI in 2002, and my ATP in 2012. Over the years, I have owned 8 airplanes. A couple of them were projects. My current airplane is a 1964 Beech B55 Baron. It was probably rolling off of the assembly line right after I was born. I am currently working on getting my type rating in a Citation Bravo. Every year you join the Bonanzas to Oshkosh (B2Osh) migration. Can you share some more about that and other unique aviation activities you partake in? After that first time, I started flying with a core group of pilots in Kansas City. We formed a formation flight group called the Beechnutz. We kept flying together and worked on more advanced formation techniques. I attended an advanced formation clinic in Grayson, Texas with some other members of the Beechnutz in 2011 where I earned my Formation Flying Incorporated (FFI) Wingman card. I earned my FFI Flight Lead card in 2012. The FFI card allows me to fly formation with other card holders in waivered airspace at an airshow. 2011 was the first year I was asked to fly in a showcase flight at Oshkosh. I was truly honored, as I never imagined that I would ever fly in the airshow at Oshkosh. We again flew a showcase flight in 2012. We did not get showcase flights in 2013, or 2014, so we are hopeful that we will in 2015. Since we did not get a showcase flight in 2014, I was asked to lead a formation demonstration for the B2Osh participants at our banquet in Rockford. I was privileged to lead a 31-ship formation flight with some of the finest pilots I know. I also really enjoy being a flight instructor, because I always learn new things when I teach different people. Being a CFI has made me a better pilot. That is a hard question to answer. I find joy in flying a great approach, or performing a smoking rejoin. I am probably at my happiest when I fly with the Beechnutz, as they are great pilots and great people. I can honestly say I have had some of the best times with the Beechnutz; both in and out of the cockpit. “Wind your watch.” I was told this by a retired Air Force F-4 pilot. It means that when you feel yourself getting task saturated, slow down. There is absolutely nothing wrong with saying you need a little more time to get set up for an approach, doing a go-around, or landing and waiting out the weather when things do not look right. Too many times we allow ourselves to get into a bad situation due to external, or more often, internal pressures; the accident statistics bear this out. If it didn’t happen, then the phrase “get-home-itis” wouldn’t exist. How did you first get in touch with your AIR agent and now friend, Jon Harden? Why do you trust your insurance to AIR? I met Jon through a mutual friend. Jon has been my agent, and my friend, since 2000. The reason I stay with Jon is that he is a good and decent man who works hard to get the best deal for his customers. His employees are the same way. I have stayed with Jon over the years because he has my trust and respect, and that is not something that cannot be bought. The pilot community offers a variety of individuals from all walks of life, each have their own story and offer something unique to the aviation industry. Was this a dream of yours as a child? Are you ‘grown up’ now? AIR specializes in a full range of aircraft and airport insurance for clients of all sizes. AIR can offer you the broadest package of protection at the best available rates. To find out more, please contact Aviation Insurance Resources by calling 301-682-6200 or visit AIR-PROS.com today and request your aircraft insurance quote! PreviousPrevious post:Cutting Costs on Aircraft OwnershipNextNext post:Why bother with aircraft renters insurance?